If your life has been affected by tinnitus, a perception of sounds when no sound is present, then you understand what a drastic impact it can have on an individual’s well-being. Persistent and unwanted sounds can impede a person’s ability to perform their daily activities, cause sleep disorders and even lead to depression. Fortunately, there are a number of tinnitus treatment options that may bring relief. Many prominent forms of treatment fall under two categories, sound and behavioral therapy. This method uses external sounds to help counteract the persistent noise caused by tinnitus. Some forms of sound therapies include sound masking, distraction, retraining and neuromodulation. A number of devices have been created for this purpose, including hearing aids, sound masking machines and notched-music devices. Sound masking typically offers temporary relief, while notched-music devices use habituation to help the patient become accustomed to the the sound and achieve relief over time. Behavioral therapies can be used in conjunction with sound therapies or independently to alter an individual’s emotional reaction to their tinnitus symptoms. The presence of unwanted sounds can be emotionally challenging. Therapy can aim to reduce tinnitus-related anxiety or stress. By altering their reaction to the trigger, patients can more successfully dissociate from tinnitus’ negative effects. Some popular therapies include Tinnitus Retraining Therapy (TRT), Tinnitus Activities Treatment (TAT) and Acceptance and Commitment Therapy (ACT). 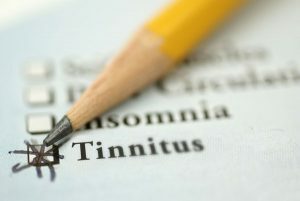 So, what form of tinnitus treatment is right for you? While a spectrum of therapies and treatments exists, the ability to treat or manage tinnitus symptoms is dependent on the underlying issue. An audiologist will conduct a physical exam and learn more about your symptoms in order to determine the cause of the disorder. Your hearing care professional will then make a recommendation on which therapy or combination of therapies will be most effective. If you or a loved one is suffering from tinnitus, relief is possible. To learn more about tinnitus treatment, or to schedule a consultation with a local San Diego audiologist, contact our office at (619) 298-8546.